All of us experience anxiety in this life. Perhaps it is overthinking something we said. Perhaps it is being afraid of being left out or made fun of. Perhaps it is a worry about the future… either tomorrow or 5 years from now. Anxiety can come and go… or it can stay. Anxiety can be a mild disturbance, or it can be a debilitating pain. I have experienced anxiety in being unable to fall asleep at night because my mind is so consumed by the future. I have experienced anxiety in putting together a lesson and wondering whether it will completely miss the mark. I have experienced anxiety for very dumb reasons and for more serious reasons. As has everyone else in this room I’m sure. I want to look at some things that Paul has to say about anxiety and how to combat it as a Christian. But before we do I also simply want to recognize that sometimes anxiety is a much deeper issue. It may be caused by chemicals in our body that we don’t understand. It may be caused by past experiences that have scarred us and return again and again to haunt us. First of all, it’s okay. Don’t feel like you are damaged goods. Don’t feel like you have to hide and act as if everything is fine on the outside. It is okay to go through deep anxiety and or depression. We see some of the greatest characters in the Bible go through deep anxiety and depression – Elijah, David, and even Jesus himself as he prepared to take on the cross and God’s anger in our place. Second of all, I want to encourage you to open up and look for help. No one is going to help you if they don’t know that anything is wrong. And there is nothing wrong or shameful about struggling with anxiety or pursuing counseling in this area. Your first and perhaps greatest step in battling against these things is to share what’s going on and begin to seek help. Tonight, I want to look at some of the things that Paul has to say about anxiety and worry… and about it’s opposite contentment and joy… as we cover the final chapter in Paul’s letter to the Philippians. Let’s remember the circumstances that Paul and the Philippians are in. Paul is not all inclusive beach resort with free drinks and food at the snap of his fingers, reading the newest bestseller, while the sun darkens his six-pack of abs. Paul is in prison, awaiting the trial that will determine whether he lives or dies. The Philippians are not a church sitting alongside the ocean where everyone has beautiful beach house and six-figure salary jobs. They are also not very well off. We read in 2 Corinthians that many of the churches in Macedonia (of which the Philippians belonged too) were in extreme poverty and yet remained generous. Paul and the Philippians are not in anyone’s ideal circumstances… and yet this is where we find Paul’s words originated and directed too as he writes on anxiety and contentment. Big Idea: We do battle against anxiety by looking to a loving God who is in control. Learn to be content in any and every circumstance. One of the greatest feelings on this earth is the feeling of happiness. There’s not much better than happiness? Think about the best day you had in the past couple weeks… I would guess it was a good day because you were happy most of the day. Your hair was done just right. Everybody was laughing at your jokes. You got back that Math Test that you thought you did terrible on only to find out that you got a 97 on it! That girl who you secretly have a crush on smiled at you… TWICE! You hit a buzzer beater in overtime at your basketball game… and guess who was watching… that girl you have a crush on… guess who just got a 3rd smile… you did. Your parents tell you your allowed to stay out an hour past curfew because you killed it on your math test. Then your driving home and your song comes on… your belting out Bad Blood as you pull into the driveway. Maybe you’ve had a day like that recently. See in this world happiness often revolves around our circumstances… when things go well we’re happy and when things go bad we’re unhappy. Which presents a problem for exiles… if happiness is rooted in circumstances… then exiles better prepare for a life of a lot of unhappiness. Why?? Because circumstances for exiles are rarely ideal. This morning, I want to show you that happiness, or joy as I’ll refer to it from here on out, does not need to be rooted in circumstances. 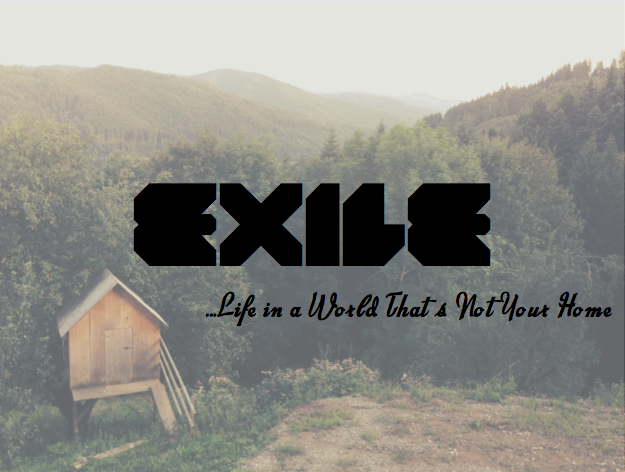 And I’ll argue that exiles actually have a joy that can’t be broken. Big Idea: Exiles have a joy that cannot be broken. Christian joy is rooted in a future reward.